Some days ago I was working on four images coming from a QNAP storage: so, four disk whose partitions were used to build up RAID volumes. "No problem" I said to myself, knowing that QNAP are *nix based and that XWF (X-Ways Forensics) is so powerful that I'll not need to switch on Linux. The third partition of each disk is used inside a level-0 RAID (striping) with a block size of 4KB (the chunk size is expressed in kilobytes, as man says), so 8 sectors (assuming 512... bla bla bla). Sets the stripe size to size kilobytes. Has to be a power of 2 and has a compilation-time maximum of 4M. (MAX_CHUNK_SIZE in the kernel driver) typical values are anything from 4k to 128k, the best value should be determined by experimenting on a given array, alot depends on the SCSI and disk configuration. Moreover from the first disk (the only one showing up to own a file system structure) I got an EXT4 volume. Ok, let XWF rebuild the RAID and inspect the volume. But... at this point XWF showed up many errors about wrong inodes... hum, something weird there... The first doubt is usually about the stripe size, under the assumption that the RAID type is correct. I got that info from the only configuration file available, so where is the issue? newly created RAID arrays should use a persistent superblock. A persistent superblock is a small disk area allocated at the end of each RAID device, this helps the kernel to safely detect RAID devices even if disks have been moved between SCSI controllers. It can be used for RAID0/LINEAR arrays too, to protect against accidental disk mixups. (the kernel will either correctly reorder disks, or will refuse to start up an array if something has happened to any member disk. Of course for the 'fail-safe' RAID variants (RAID1/RAID5) spares are activated if any disk fails.) 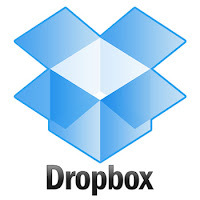 Every member disk/partition/device has a superblock, which carries all information necessary to start up the whole array. (for autodetection to work all the 'member' RAID partitions should be marked type 0xfd via fdisk) The superblock is not visible in the final RAID array and cannot be destroyed accidentally through usage of the md device files, all RAID data content is available for filesystem use. That's interesting: first because if images (or disks) were wrong labeled, you can reorder the disks. Moreover you get a lot of information to verify the RAID type, the RAID UUID and... the chunk-size. Where this data is memorized? It's intuitive, but from the linux raid source code (thanks God is OSS!) 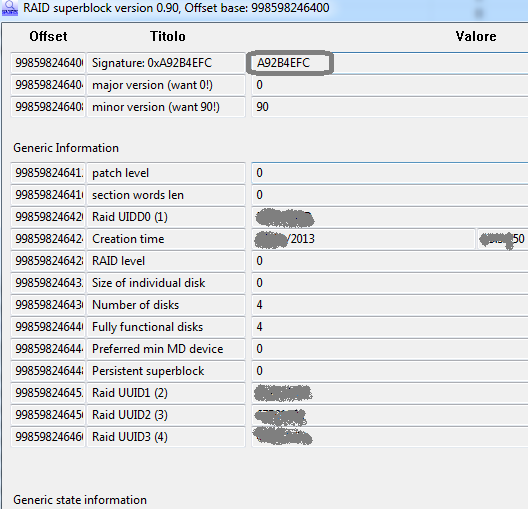 and from RAID_superblock_formats, I got all the information needed to explore the RAID superblock. You know where to apply the template ("The superblock is 4K long and is written into a 64K aligned block that starts at least 64K and less than 128K from the end of the device") and you know the magic value. So, in my case, the stripe size (chunk size) is 128 sectors... and XWF was able to complete its work. Here is it the template: cut and paste inside a tpl file and use it with XWF. Note that only version 0.90 is "supported". template "RAID superblock version 0.90"
description "To be applied to RAID superblock"
uint32 "major version (want 0!)" uint32 "minor version (want 90!)" hexadecimal uint32 "Raid UIDD0 (1)"
uint32 "Size of individual disk"
uint32 "Preferred min MD device"
hexadecimal uint32 "Raid UUID1 (2)"
hexadecimal uint32 "Raid UUID2 (3)"
hexadecimal uint32 "Raid UUID3 (4)"
uint32 "(v>90) new chunk size bytes"
section "RAID disks descriptors (first 6 of 27)"